Each type of file or document is opened by a default program within your apple system. Sometimes, however, you want to open the file with something other than the default application. Here is how you do it. Your buddy sends you a document that defaults to Microsoft Word but you really want to open it in Pages. How do you do it? Here are the several different ways to do it. You can drag the file you wish to open onto the appropriate application icon on the Dock or in Finder. You can also press and hold ctrl while clicking on the file you wish to open. 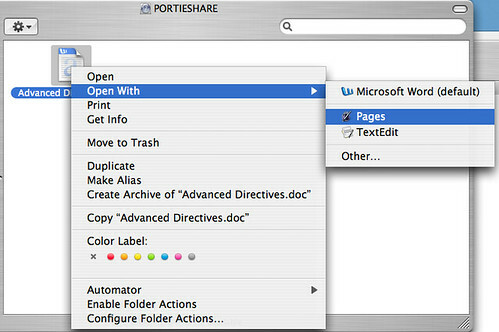 From the menu that appears, select Open With and select the application with which you want to open the document.